Some students seem like natural performers. They know how to “work a crowd,” they dance with energy, and seem to move with joy. Certainly, experience as a performer plays a big part in this. Like anything else, practice in performance allows you to learn what works and what doesn’t. “Natural” performers, however, seem to know something that others do not. Here’s a list of some of these secrets. 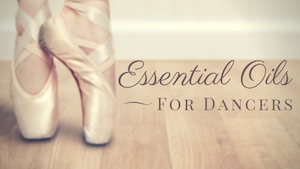 Actually, I’m not sure there is truly anything “secret” about these (I really couldn’t resist the alliteration), but perhaps these are tips and aspects of your dancing you haven’t put much thought into before. As you work toward your final performance be sure to put these skills into practice with as much (or more) diligence as learning your steps. Include the audience in your performance. Do not forget or ignore that they’re there. If this makes you nervous, it may be useful to know that according to The Anxiety Treatment Center (Chicago area), involving the audience can actually lessen your anxiety or stage fright. Be aware of other dancers in your group. How can you involve the audience or the other dancers on stage with you in your performance? Make eye contact, direct your energy to one person within the audience or project your energy to the others around you, and use or respond to the energy of others give to you. None of these are things that you DO so much as things you FEEL and THINK as you perform. Facial expression is important in dance but it’s more than just smiling in a performance. Real or sincere facial expression often has more to do with the eyes than with the mouth. So, rather than focusing on a “smiling” mouth, I suggest that students practice an “open” expression with their whole face but especially the eyes. Although THINKING or FEELING this concept is at least half the battle, there are some things you can DO in this case. As you perform, engage the muscles in the face by slightly lifting the eyebrows – not to a comical extreme, but in a way that is comfortable and easy to maintain. It is the same expression most people use when making eye contact with or really listening to a friend, or when they are speaking excitedly in conversation. Audiences respond well to performers who utilize this technique. Truly SEE, LOOK, and TAKE IN the world through your eyes as you dance. As for the rest of the face, be natural. While a smile can be important during certain types of dances, it will not match the mood in all dances. Relax the lower jaw. This will improve any type of expression and, if fitting, make possible a smile that comes easily but is not plastered to your face. While counting helps dancers to be precise and together in their movement, musicality in performance is expressed through more than just counting beats. When counting, it is easy to forget that a beat includes not only the sharp “tap” of a particular rhythm but also the space between those taps, just as all movements include transitions and shifts of weight between desired “shapes” of the body. Exciting and musical performers fill these spaces in the music and movement, not letting the energy or intent drop between shapes or between counts. 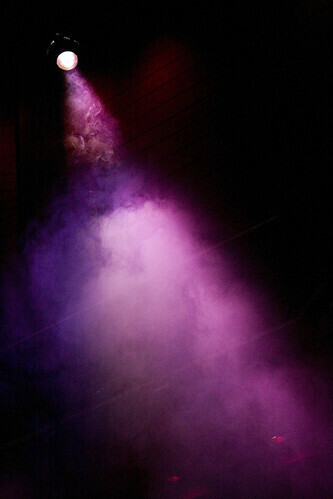 Enjoyable performers also utilize dynamics in their performance. Resisting “sameness,” as they dance, they incorporate crescendo and decrescendo (sudden or gradual changes in the quality of the movement) that often reflect or work within the accompanying music or score. Choreographers utilize music in different ways and a good performer will seek to understand what part of the music (rhythm, melody, counterpoint, etc.) the dance-maker is using to inspire their movement. 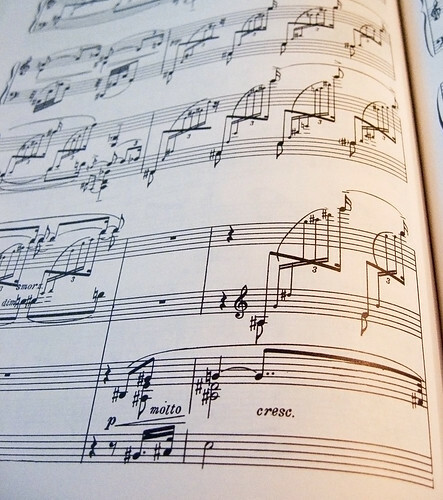 It is always helpful to have at least a basic understanding of music composition or theory but THINKING about what you FEEL and HEAR in music and applying these to your dance practice is the first step in bringing musicality to your performance. In fact, a performer can be musical even without dancing to music! The more you understand the music, the easier you can dance. The audiences ears hear the music, and their eyes see you being that music. Dance is the music made visible. You ARE the music! Don’t confuse attitude with confidence. Attitude is something which is acted or portrayed. Just as any role would, attitude requires a level of confidence to be played well but, it is simply a layer or a persona the performer wears in his/her performance. Confidence is trust in yourself and in the situation but, it is not centered on the self. Trust in yourself and your fellow dancers is the practical side of confidence and comes from preparation and experience. The work you put into the dance steps and sequence, the time and effort you put into class and technique, the build up of experience on stage or of situations in which you must improvise or think on your feet. These things allow a performer to trust. Exuding confidence does not require one to act in a self-centered manner. In fact often it is quite the opposite. Dancers with confidence give a lot of themselves without dwelling on what the audience is thinking of them. This allows the performer to focus on making good use of all that preparation, overcome mistakes when they arise, and concentrate fully to the performance itself. I talked about acting when I mentioned attitude above. Just as musicians understand the music, actors understand the context (the situation, the scene, the conditions, and background) within which they are performing. Dancers, as actors, should be familiar with the time period or origin of the dance, understand the emotions of a piece or have an idea of what the choreographer is trying to express or intend. Like actors, engaging performers, also “suspend disbelief” or, make the audience believe something even if it is not true or actual. Dancers pretend to be happy, curious, confused, or angry even when they are not. Much of being a convincing performer is making something seem real even to yourself – evoking emotions that were not present a second ago. Being real in acting also involves observing and discovering what is natural or of human nature. If a prop accidentally falls to the floor during a performance, an actor who is being “natural” would not ignore it. What do you really do when something falls – do you try to catch it? I’m not saying that in a dance you should stop and pick up a prop when it falls (because timing can be crucial in a dance) but becoming an excellent performer requires investigation of and experimentation with different kinds of behavior (guided or otherwise). Long experience has taught me that the crux of my fortunes is whether I can radiate good will toward my audience. There is only one way to do it and that is to feel it. You can fool the eyes and minds of the audience, but you cannot fool their hearts. Hey, maybe there are some secrets in here! Although good acting usually reveals something to an audience, a good performer knows that playing one’s hand all at once is not a good idea. 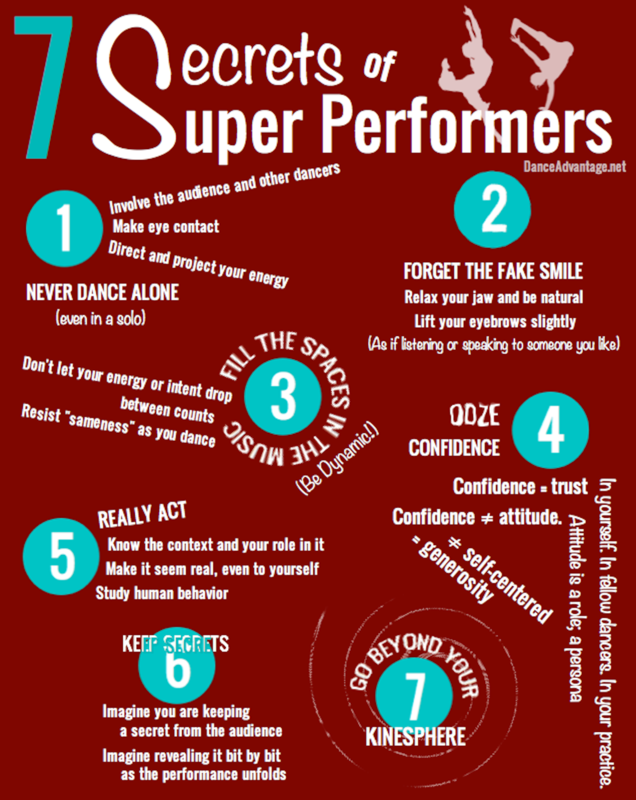 As a dance performer, you don’t always have control over the content or plot or story of your performance. The choreographer ultimately is responsible for this. But, it helps as you perform to imagine you are keeping a secret from the audience. Think about how it feels to withhold something you want to share with someone else and apply that type of contained excitement or knowledge to your dancing. There may be natural points in the choreography that you might build toward or reveal portions of this secret — like opening birthday presents one at a time. This may seem a little abstract but give it a try. 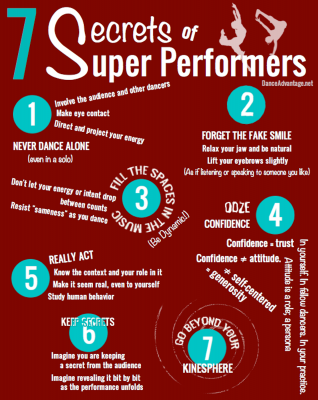 Even if you don’t know what your secret is, pretending that you have one as you dance changes the energy on stage and has made for some compelling performances. It helps depict the fun in your dance without relying solely on happy or joyful feelings. After all, not every dance is happy but they can all have their secrets. Kinesphere is a word used in dance that describes the space surrounding the body. It is the imaginary bubble that encircles your frame in stillness and as you move. Again, dancing beyond this bubble is something that you must IMAGINE as you dance, not necessarily something that you DO. Moving with a sense of directing or expanding your energy beyond your kinesphere will not only make you a more engaging performer. If practiced throughout your classes as well, projecting energy beyond your fingertips and toes, out through the top of the head, from your eyes, or even from every cell in your body, can improve your execution of the movement as well. When it comes to the requirements for pleasing an audience, all the knowledge and instruction and apparatus in the world is worth less than one ounce of soul. So, what are YOUR secrets? What makes a performer enjoyable to watch? How do you engage an audience? In your observation, what qualities do great performers possess? My teacher always gives us imagery similar to the “dance outside of your kinesphere” suggestion. The “fourth-wall” is an acting term used to describe the imaginary wall between the audience and the stage, and we are told we should always attempt to break beyond that wall. Yes! That is a very similar idea and absolutely important in terms of acting for both actors and dancers. The 4th wall and breaking beyond is a good image for use of voice (if you’re using it) and facial expression, too. This combined with the kinesphere idea is excellent – I really like using the image of a bubble or sphere surrounding the dancer that they have to push beyond because it is a very 3-dimensional image, just as dance is a very 3-dimensional artform (despite being performed on a proscenium stage) – a dancer has to think of reaching and extending out in all directions and have awareness of the front, back, and sides of the body. Thanks for this article. It has really helped define performance skills on a higher level. I will definitely try to incorporate more of this into my dancing. You are very welcome Travis. Thanks very much for reading and I hope you find that applying these takes your dancing to a new level! Imagining dancing outside of my kinesphere has really inspired me. I will be sure to remember all of these techniques in my performances this weekend. Thank you for this article! Hope your performances went well, Christina! Thanks for stopping by. Happy Holidays! Nichelle, thanks a lot for this. Very insightful and very helpful. All the lessons you posted here is exactly what I needed as I am currently attempting to help myself and the rest of my crew improve. I want us to perform on a whole new level. Will try to break this down into our language. Hope it will work. Thanks, Leon! Best of luck to you!! I love this website. Every week you have informative information on so many aspects of dance. This week is no exception. I have printed this week’s “What Super Performers Know” knowing my students will learn some new ways to enhance their performance. Thank you!!!! Sorry for the delayed response, Isabelle but thanks so very much for your kind words, enthusiasm, and for sharing! It’s all greatly appreciated. I am not the dancer, my daughter is but I just want to say that a dance is really more of an expression of thoughts and emotions and when you put your heart into the dance, it just looks so captivating. Thanks for sharing this, I will definitely let my daughter read this too! Hi! First I want to thank you for the good tips! 😀 They really helped me to improve my dancing. But I have one question about that first one, “Never dance alone, even in a solo”. What if I’m doing a dance performance all alone (which I am)? You see, even if I really, really want to have a dance crew, I have to dance alone. It’s simply because we either have one single dance school/class where I live. :/ I am also the only dancer here except of four others, but they just do breakdancing for competitions. I dance some jazz, a little ballet, pop and some hip-hop as well, every single day. I do it because I can’t resist the urge to have such a condensation with the music and my body. 🙂 That’s one of the reasons why I can’t make a dance crew with them… Sigh. Hi Louise, what Nichelle meant with â€œNever dance alone, even in a soloâ€, is that aside from ‘being aware of other dancers in your group’ (which you won’t have to do, of course, in a solo), you have to involve your audience in your performance. After all, it is for them that you’re dancing; I mean you are performing the piece for them. So you have to involve them, meaning you engage them with your dancing, so that they will “actually experience” your performance — instead of just talking to their seatmates or thinking about thoughts other than your dance. Hmm… I hope you get what I mean. Haha! Thanks Leon, that’s exactly what I meant. Louise let me know if you have further questions on the concept of engaging with the audience = never dancing alone. Dance and dream out loud!! Thanks so much for the help! I really needed to talk to someone who knows what they’re talking about. 😀 But then I have another question to my solo dance: do you have any ideas of what I should not do since I am alone and maybe some tips on what I have to focus on? I don’t mean to nag, it’s just a bit hard to learn everything by myself. Please understand. Thanks so much for your help, Nichelle and Leon! It is an awsum secrets for dancing.Some points which you told do match with my qualities. Well, I would like to know how to conserve my energy ?? Sometimes i loose it and lower my performance. also i loose my facial expression. Is it very necessary to be flexible?? Since My body isnt flexible, so how to make it flexible? Thank you for consolidating this info, Nichelle 🙂 This is a fantastic resource! i am so nervous for my dance recital this helped me alot!! I am a salsa dancer and mostly does partner work, though choreographing shines is part of the dance as well. Though I can follow very well, I am told by my other dancers, I just am missing the element of individuality. I am struggling with making the dance my own and not completely depending on the lead. I do not have an arsenal of things to do or when to do them. Your article is a great start to get me thinking. Any additional tips? Thanks. I am also a musician, and have so far enjoyed the information on your blog concerning many aspect of teaching and musicality. Nice!! Thank you. Hi Nichelle!! You are freakin’ amazing! Came across your site and your tips are so insightful and, well…exactly what i needed. Thank uU!! Can you elaborate a bit on how to”radiate goodwill’ to your audience? cheers! Hi Gianna, that’s a good question. That quote actually comes from Howard Thurston who was a magician and actually really great at “marketing” himself as a performer. In every town he was scheduled to tour, much to the chagrin of his management, he would perform free shows. His manager felt this would destroy any change he had at getting people to his paid shows but in fact it did the opposite, fueling more interest instead. Smart guy! Anyway, his habit of “giving away” what others thought he should get paid for is partially what he meant by generating goodwill, but sources also mention that Thurston felt an audience can tell when a performer’s motivation is self-serving. He didn’t do free shows to get something in return but because he wanted to give his gifts. Genuinely wanting to bring an audience your best performance so that they walk away happy or fulfilled or intrigued or enlightened or ________, is also fostering goodwill. In Thurston’s experience (and in my own as well), when your heart is in the right place they’ll give back to you everything you’ve given away with enthusiasm and loyalty! Hi, thank you so much for this!! It has helped me with my GCSE dance coursework and my dance assessment i have next week loads! Such great tips and advice! I’m not a dancer, but found really helpful as a musician, thank you so much. Sure thing, Kayla! Meat and potatoes is what we like to have on the menu here! Let me know if there are other things you’d like to read about on the blog. Hi Nichelle, I have found your article really helpful. I am a dance teacher and I find that one of the most difficult things to teach a dancer is to perform from the heart and thus achieve really pure and sincere facial expression and body movement to go with their music. I also found the idea of the bubble very interesting and cannot wait to put it into practice. I have been telling my dancers to think of shooting laser beams out of all extremities to have them extend their moves but that doesn’t seem to work, so I’ll try your idea. What do you mean when you say ‘resist sameness’? As a solo performer, I prefer to start on stage and this allows me to “great” my audience as I open my right arm into 2nd position and give a slight nod of my head. It also gives me a sense of the energy that I have to work with. If I must use an entrance, my trademark is a burst of energy to contact the audience. I like to think that I want everyone in the audience believes that I am dancing just for him/her and that he/she is special to me. The honor me by being in the audience. I am more shy as part of a group because I do not want to make mistakes. However, I will still interact comically or what ever the emotion suites the dance depending on how we have all interacted during practice. I am always honest with my audience and I reply to them, I am responsible to them for giving them an unforgettable life experience. Amazing article ! thank you! much needed lessons for this weeks performance!